We've said this many times before but Big fuel Communications CEO Avi Savar is saying it with much greater detail. Check out his guest post on the notion social media should be approached as if it were a cocktail party. 1) Social Media is one giant party. Imagine the social web as one huge cocktail party. In one corner of the room, a group of moms are talking about education and parenting issues. In another corner of the room, a group of recent college grads laugh over Will Ferrell's latest movie. Everywhere you turn, different groups of people are enjoying themselves, sharing stories, discussing current events, pop culture, trends, etc. All the groups are mingling, making new "friends," and the most influential people in the room have the most "followers" hanging on their every word. Social Media is a true reflection of society today--and what better representation of social behavior, fragmentation, hierarchy and influence than a giant party? 2) Lead with "people stories," not "product stories." Marketing has taught us to always lead with our "product story": distilling our message down to a "unique selling proposition" and driving it home with features and benefits. As a brand marketer, your first priority has always been to show or sell your product. And it works well--if you only have 30 seconds to sell your product through a message that's blasted out into the world. However, if you walk into that party and the first thing you do is try to sell your product, nobody will talk to you and you certainly won't get invited back. You walk into the party and head for the group of moms in the corner. If you interrupt their conversation to talk about your "new and improved hydrating face cream" or your "ultra-absorbent paper towels," chances are you will alienate the group or simply be laughed out of the room. To become the life of the party you can't lead with product stories; you need to lead with people stories. If you want that group of moms or those recent grads to listen to you, you need to enter the conversation on their terms. You have to start a dialogue with something that is important to them, not what's important to you. Only then will you have earned the right to talk about yourself. People need to like you first, then they'll ask what you do for a living. This means it's critical to have the right "opening line"--a way to enter the conversation that starts with the consumer's agenda but can seamlessly migrate to your agenda. 3) Use content to make connections. The right story, joke or anecdote at a party goes a long way, and social media is no different. If those moms are talking about parenting issues, turn them onto a parenting expert who can help with their problems. If those grads are laughing over Will Ferrell's latest movie, give them something similar to laugh about or recommend another movie for them to see. The right content will allow you to make instant connections. And that means you need to think of your fellow party goers as audiences rather than consumers. Like a publisher, you need to help or entertain first; showing or selling comes later. Just like a party, social media is made up of many groups. People with different interests, different likes and different dislikes. This means that you can't use the same opening line with moms that you used with those college grads. Every audience is unique and you should speak directly to each group. This means you may need a few different "opening lines" if you are going after different audiences. In the same way you would "work the room" at a party, the way to get scale in social media is to break your audience into segments. As you walk around having conversations with different groups of people, you naturally adjust your talking points based on who you are speaking with. 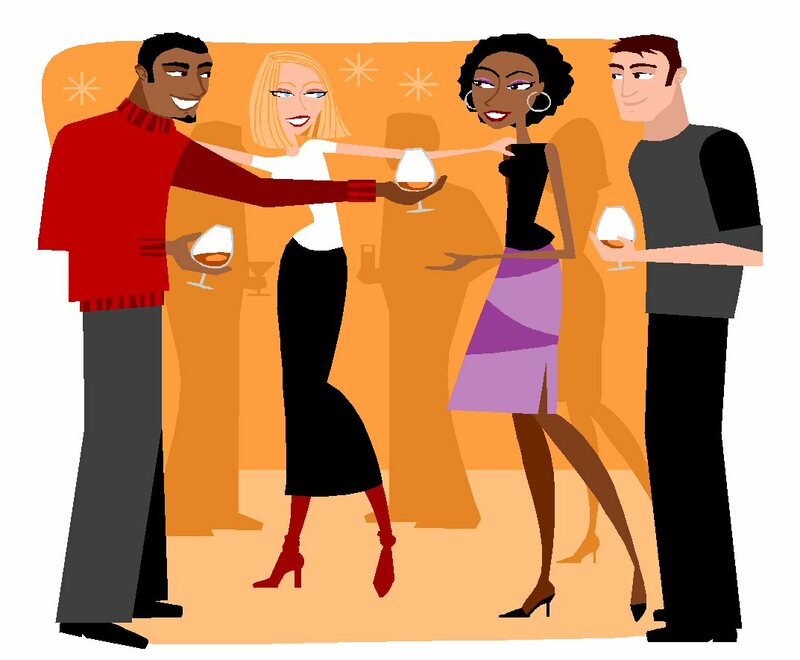 At the end of the night you will have met everyone at the party; if you are interesting, relevant and sociable, people will remember you and be willing to learn more about you (and your products). Have you ever walked into a party where you didn't know anyone? It's not impossible to meet people, but you certainly have to work hard at it. Now, what if you walked into the party with the most popular kid in school? You get instant credibility, everyone in the room knows who you are and talking to them becomes that much easier. Simply put, leveraging the right influencers makes you "cool by association." You don't have to work as hard meeting people, you get to talk about yourself more and instead of trying to figure how to start a conversation with people, they will come talk to you. Brands are obsessed with impressions. For them, it's always been about reach and frequency. Well, when it comes to social media, the name of game is engagement, not impressions. If you walked into a party and just stood against the back wall, people might "see" you standing there. You may even make eye-contact with a few of those moms you so desperately want to talk to--but what good will that do? You could go to 1,000 parties and stand against the wall at each one of them. Eventually people may recognize you--but they won't know anything about you and there's still no basis for them to have a relationship with you. The Social Media Party is not about making eye-contact (impressions); it's about shaking hands (engagements). It's about meeting people, talking to them, sharing with them--it's about engaging with them and participating in the conversation. The party analogy is a whimsical way of saying that brands can't treat Social Media the same way they treat other mediums. For the first time in history, brands are trying to navigate a two-way channel of communication. This means they can't talk at consumers. Instead, they need to engage with audiences. Social media requires a value exchange between the consumer and the brand. 1) Pretend like you're getting dressed up for a giant party. 2) Lead with people stories, not your product stories. 4) Try to align yourself with the "in crowd" so people will want to talk to you. 5) Don't just make eye-content, shake hands with the people you want to meet. Avi Savar is the Founder & Chief Executive Officer of Big Fuel Communications. The company's client list includes: General Motors, WEtv, Colgate-Palmolive, Fisher-Price, McDonald's, Budweiser, Yahoo!, among others.